Posted on 04/28/2015 by Mickey McCarter	in Live Review and tagged Charles DeChant, Daryl Hall, John Oates, Mutlu, soul, Warner Theatre. 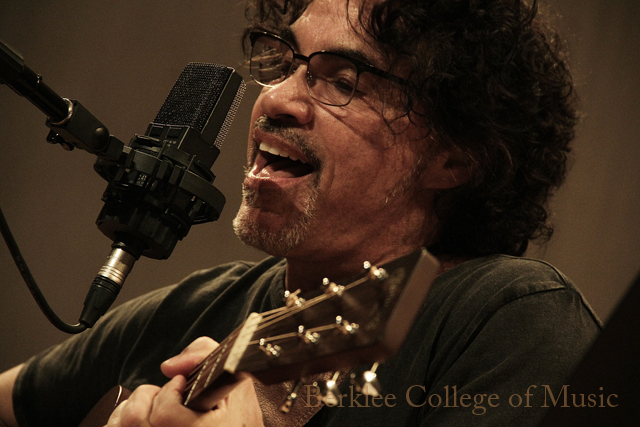 John Oates visits the Berklee College of Music on April 14, 2015. Daryl Hall and John Oates, the dynamic duo who kept breaking records since their first album in 1972, return to DC to perform at the Warner Theatre on Wednesday, April 29. I last caught Hall and Oates, as they are colloquially known, at the Warner on Oct. 2, 2013, in a damn fine show. The gents and their band raised blue-eyed soul to a whole new level that night, as they ran through about 14 songs in their catalog with a heavy focus on their material from the 1970s. The duo made me happy as well when they hit some of their tunes from the 80s, including “Private Eyes” and “I Can’t Go for That (No Can Do).” Their six-man band rose to the occasion, particularly sax player Charles DeChant, who has been performing with the guys for many years (and who proves to be a draw himself). Tickets are available online and at the box office. Based on my last time seeing Hall and Oates, you absolutely shouldn’t miss this show. Soul and reggae singer Mutlu, who hails from Philadelphia like our heroes, opens the show.